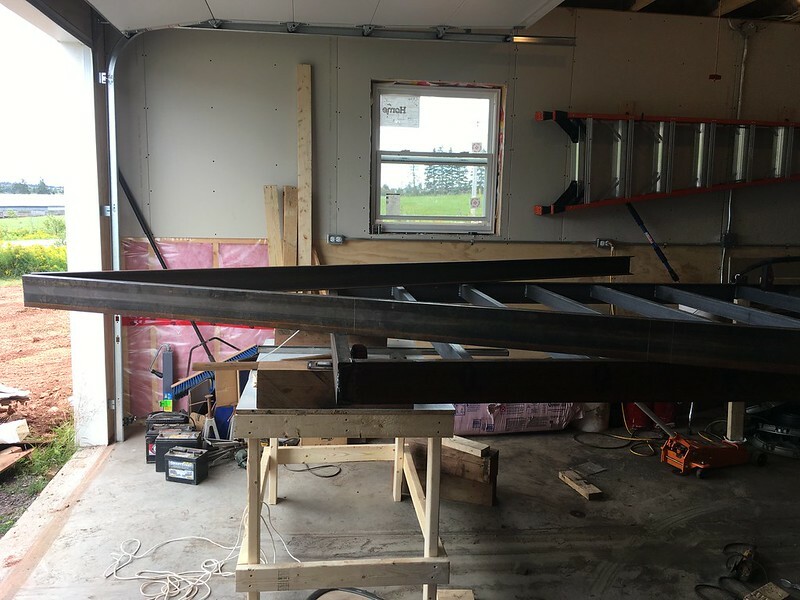 Well, I got tired of trying to see joints I was going to weld with the frame 6" above the floor, so I lifted the ends up with the Kubota, and now it's 38" off the floor! Should be much nicer on my back too! Sounds about the same height I did my bumper at. Much better height for sure. You'll end up sitting, but will be exponentially longer, and you'll be able to see for sure. 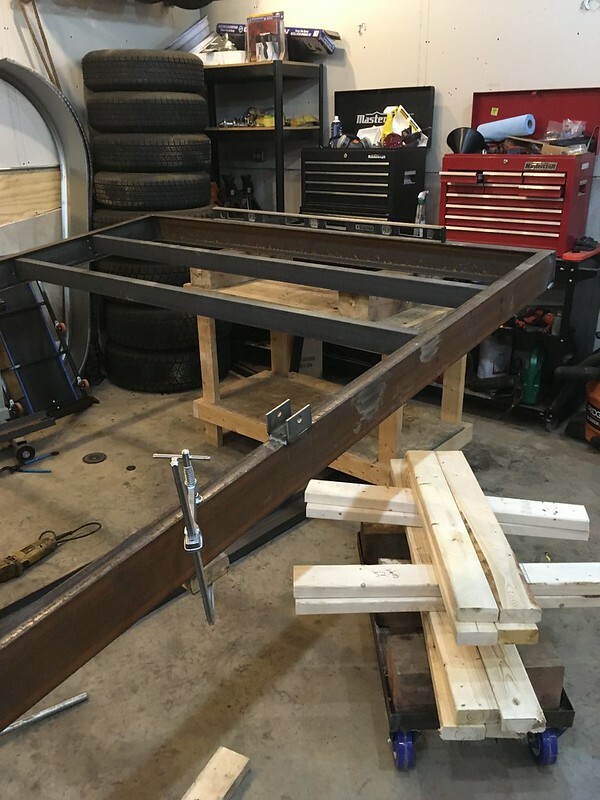 I'm so glad I raised this frame off the ground, so nice to be able to sit and weld! Here's a pic of my vertical up welds, I think they look ok. 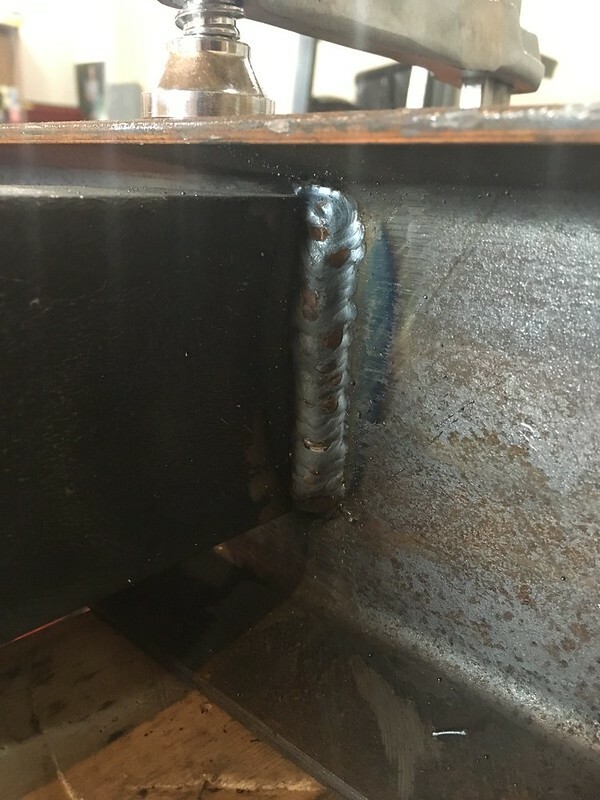 It's not my favorite weld to do, but much better when I can sit and do it at eye level! Here's two different cross members. Each bead has a little bump in it where I have to run over the existing tack, which was done with flux core wire, but it's not too terrible. On your vertical up are you doing a Texas 2 step with your gun vertically? Holding as vertical as I can and doing inverted V, is that the same as texas 2 step? Penetration looks OK, but shouldn't have the high bead down the center. I think you need a little more heat and clean the weld area better past the coating. I was sorta thinking that as well. Perhaps I'll try bumping up the volts and see what happens. The wire speed is about as fast as I'd want it, and perhaps that's part of the problem too, that I could just be moving the gun along a little faster? I tried a lower wire speed, but it just sounds...well too slow! You need bare metal, clean it up some. Yeah I know it should be a lot cleaner. Problem is they are all tacked in place. I suppose I could/should pop them off on at a time, clean up, re-tack and then fully weld. Well at least the 8 of 13 that aren't welded yet that is! Like painting, prep is 1/2 the work. Get a HF scaler, that may scrape it off. Many way to do it now, just not as easy. 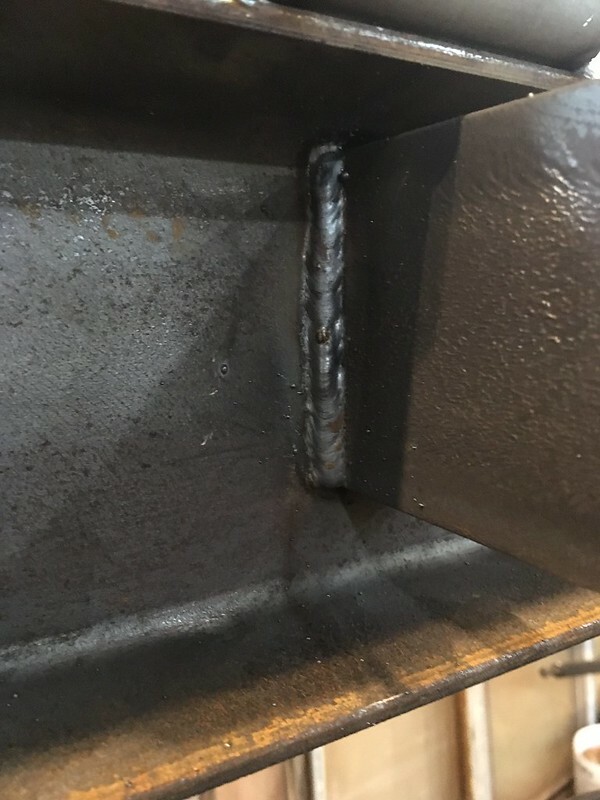 I'm not good at reading welds from a picture alone but your weld seems small. I think you need to crank heat and speed up while making your pattern larger and moving faster. Make sense? Cleaning everything beforehand would have been best but you should be able to dial in so that it isn't needed. 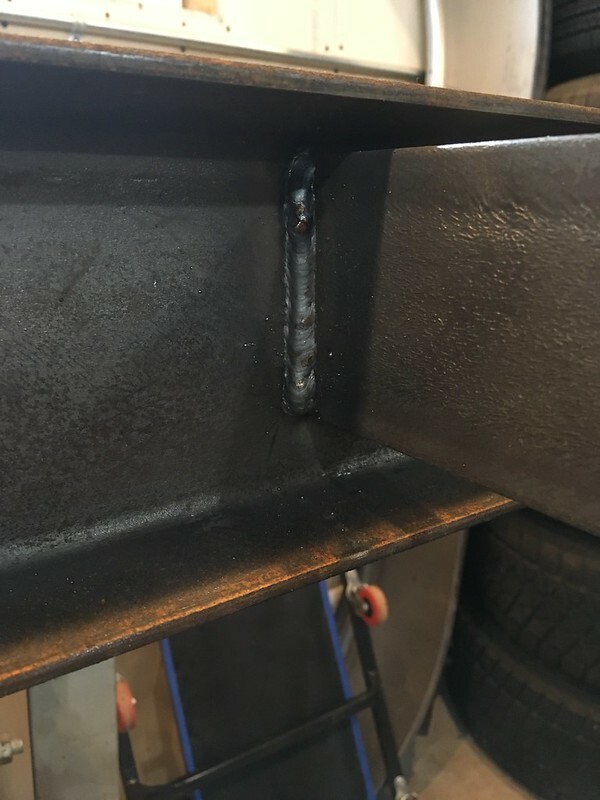 I always have a hard time doing a vertical up weld. I seem to be able to control the puddle better going down. You just need to make sure you keep ahead of the puddle. A lot depends on your settings / machine. Texas 2 step is more of a quick up then drop back & fill. Then quick up farther then back and fill. Kinda preheats the metal as you go. What you're doing is more of a side to side weave & depending on machine may be what you need to do. Edit: metal shouldn't need to be prepped more than it is. Crank your heat and or move slower. If you can't burn through a little mill scale then you have other issues. I knocked off and cleaned up the remaining two thirds of the cross members, mostly to see if the welds would be a little different/better. It actually didn't take much time. I figured I'll have no other better opportunity, and worse case, the welds looks the same, nothing to lose really! Much better. The welds will be cleaner and you will be happier. I'm with the others, more heat will also help. rcampbell, how do you like that compressor? I've never heard of the Omega brand. It's been great! It's a company here in Canada, in Ontario. They do more of the industrial type stuff, but also contractor stuff too. Mine is from the professional series. Mine is the PK6560V model, which is really more compressor than I need, but not really :) I've been very happy with it for sure. Just a quick update. welded in the cross members that I cleaned up with the grinder. The welds look pretty good I think, I'm happy with them. Think there's be any benefit to welding inside the C on the cross members as well, or would web and flange on the outside only be ok? Welds look good, if you're not opposed I would fully weld them all the way around. In areas where salt & rust are an issue I think it will make the trailer last longer. If not that's a spot where crap can get in & start deteriorating the joint. If it was a non structural spot I would recommend at very minimum caulk the spots that you didn't weld prior to paint. Yeah that's along the same lines as I was thinking as well. Probably won't need it for strength, but will seal up the little nooks and crannies better. Laying up the tongue pieces now. Gonna get them in place and centered etc, and then tack them into place. After they are tacked and I have cut the notches I can bend around the ends of the wrapped tongue and weld them into place as well. My angle is a little less than 50 deg, more like 40 or 45, but i think it will be fine, as I'm not using a 50 deg coupler anyway. I'm welding an adjustable coupler, that is basically 12 inches of vertical channel with a bunch of holes in it. Good call on the adjustable coupler. My dump trailer has that, changing between trucks is quick and easy as long as the wrenches stay in the tool box. Same here. It is a great feature on my equipment trailer. You know, that had crossed my mind. If I ever get a bigger truck/trailer combo, I'm thinking it'll be a goose neck trailer for sure. Got my tongue bent and tacked on. Each side of the tongue measures the same distance to the front corner of the trailer, and everything seems to be squared up nicely. Another one of my dumb questions but you are measuring from hub (front axle) on each side to the front / center of tongue to make sure it pulls straight? Some guys even have the passengers' side a little shorter (1/16 to an 1/8") to help with crown built into most roads. I've never done that for the record but have heard of guys doing it that have built a lot of trailers. I will yes, once I get the axles up on the springs. I'll do a final check of a few things to make sure it's all still square and then sew it up good and solid. I'll then grind off any sharp corners on the bottom and paint the bottom while it's still upside down. I bolted on the front axle, and measured from front side of tongue to center of opposite axle. Did both sides, and they were exactly (well 1mm or less in the difference) the same. So I welded on the angle piece of the tongue to the frame. I will clean off the frame and wrapped part of the tongue tomorrow and fully weld up what I can while it's still upside down. I then trimmed the front of the tongue so it's flat. And I'm debating the best way to weld on my hitch mount. I'm thinking either contour it so that it fits nicely. Or weld some plate on and then well the hitch mount to the plate. Any thoughts? 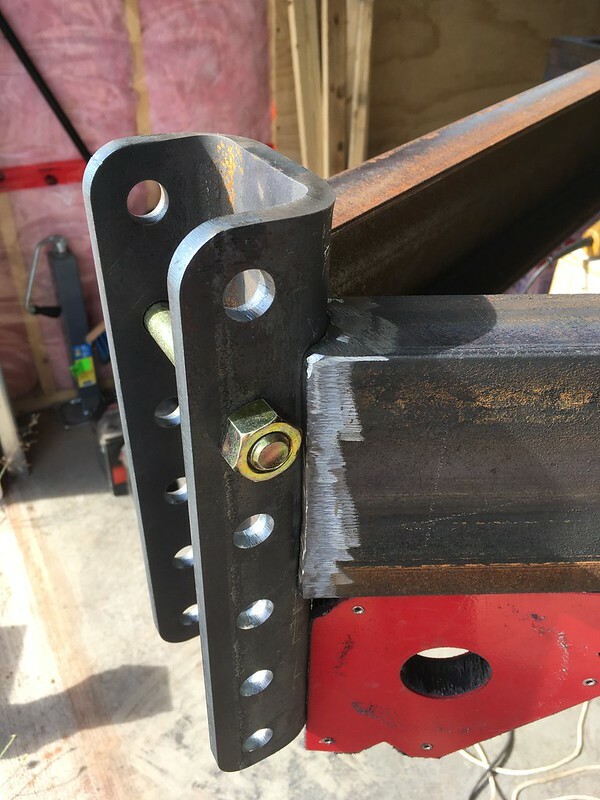 If you weld both outside & inside that channel vertically it won't go anywhere. Only other thing I might do is cut a gusset to lay on top & bottom of a-frame then weld it on. Only would need to be 6" front to rear & if adjustable channel extends above or below then you could add additional vertical gusset to it as well. I will definitely gusset the top half. There will be probably 3 holes above the tongue. I'm hoping if I contour the tongue a little to the round edges sit back into it a little better it will close up those gaps some. That, or triple pass it. 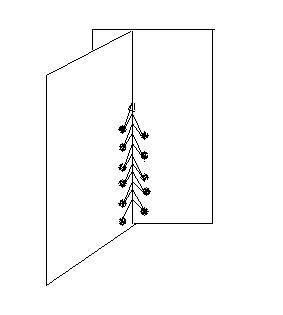 Triple the inside first then you may be able to clean up outside with just a double pass or maybe a single? 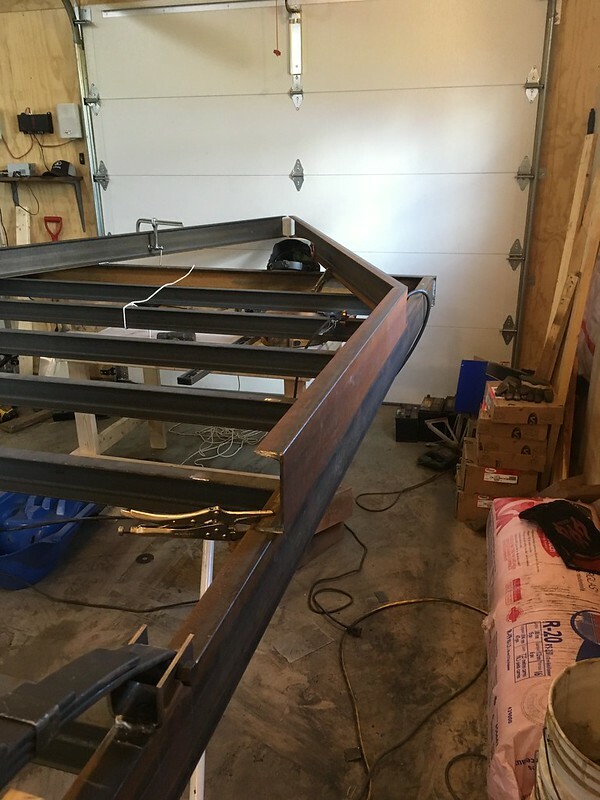 I'd contour it in a bit, then as Shawn says triple pass the inside, gusset too and bottom, and clean and weld the outside with whatever it takes. Verticals may be overkill, but I'd do them as well. Overkill is not a bad thing in some areas, and this would be o e of them IMO. That looks like a pretty healthy gap in the pic. I would try to set it back some I'm the channel to close up the gap. Make sure you don't go to far and cause an interference with the coupler though. Then make a few passes on the inside and finish up on the outside. 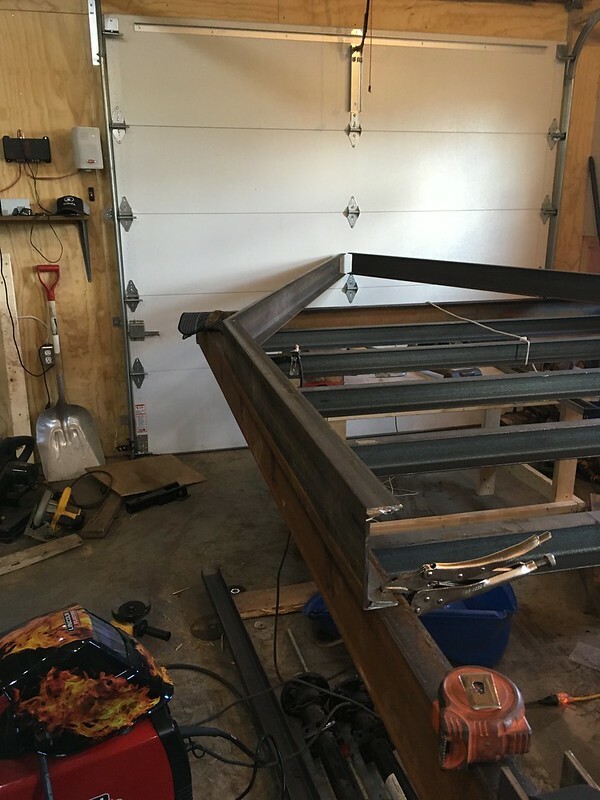 You should be able to weld all four sides on both the inside and the outside. If I remember correctly you are going to need to use a grinder to fit it? What size wire are you running and do you have a copper backer bar? If your running .035 and have a backer I would probably just fill it and run a few extra passes on each side. Would prevent a lot of screwing around with the grinder. Contour and gusset. Never worry about it again. But I cleaned up the metal and am ready to weld, will just have to try and move everything back a little. I put a bolt in to make sure I didn't get so deep as to not allow the nut to thread on properly. Contour looks good, you may want to grind the front vertical edge of those channels a little more. In doing so you would give yourself a nice area to lay an inside 90 degree weld & fill it in making it look very clean. Not a bad idea at all, I'll give it a try! Will finish up very nicely. Looks like you've got a great fit now too. I got thinking about this more. Do you guys just mean to grind it back more, or do you mean to angle the edges? 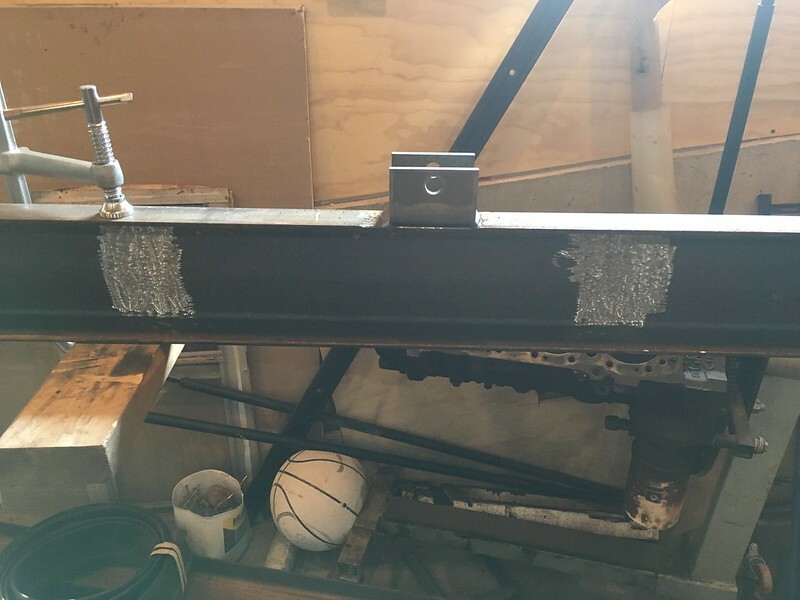 Grind the front vertical edge of the channel so it is parallel with the front of trailer side to side. 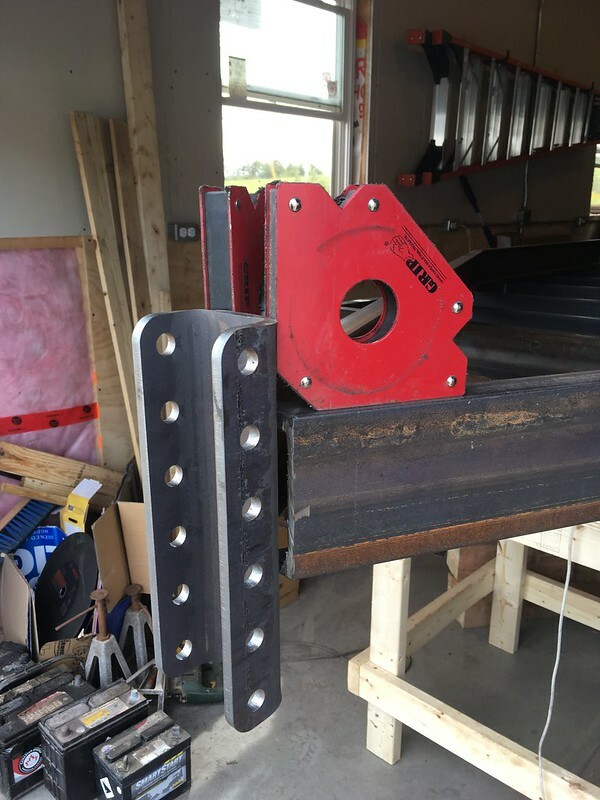 So basically you will be grinding the channel back so you can see the full thickness (actually a bit more as the channel is on an angle) of the channel next to that formed hitch mount if you are standing in front of the trailer looking at it. Make sense? Even though it is heavy, I would try to roll the trailer on its side for the welding. With clean metal, a good V and gravity it will be solid! Yes ok I thought that's what you meant. I had it like that before I did the contouring. I trimmed the front of the tongue so that it was on a flat plane parallel with the front of the trailer. But I'll be sure to grind it as you suggest to make sure I have lots of surface area to weld to. Yes I agree that's the way to do it for sure. 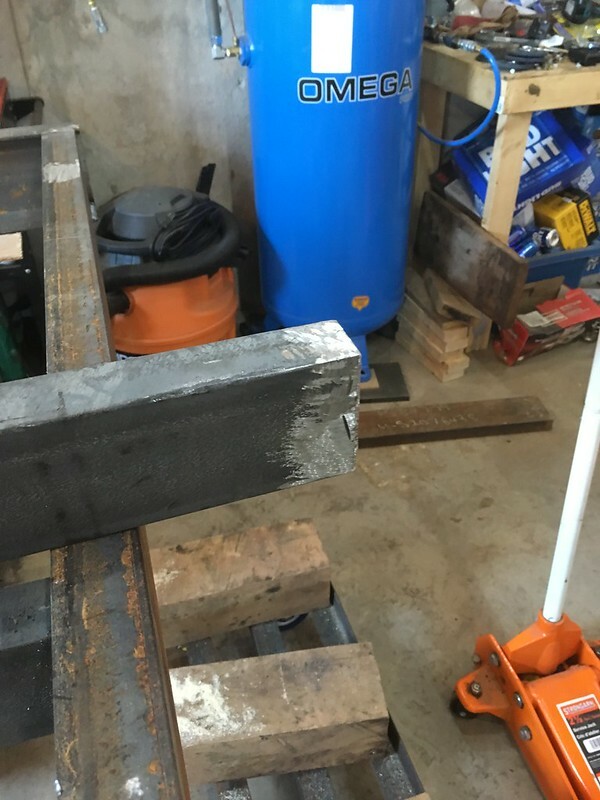 I'd definitely want to weld is partially or brace it or something before I tip it over so that nothing sags or moves out of place. I actually thought I may weld the whole thing on the inside, and then flip it and do the outside (ie. visible) welds horizontally so that they are both strong and look nice.